James Worldwide has experienced Licensed Customs Brokers that can file your Import Security Filing (ISF) and other import-entry-related information with U.S. Customs officials, monitoring your imports throughout the imports clearance process. Working with Customs (CBP), FDA, FCC, EPA, ATF, FSW, DOT, CSPC and all other government agencies allow us to provide you with comprehensive customs clearance support, and to help you achieve your business goals. Leverage our experience and expertise to gain a competitive advantage on your imports by minimizing your duty, pre-clearing Customs and staying in compliance with Customs regulations. Navigating the often-complicated process of importing goods can be intimidating without an effective Customs compliance strategy and a reliable Customs broker on your side. We act on your behalf to process your Customs entries, ensure you are compliant with Customs regulations and get your product delivered promptly. Our value-added customs brokerage services are provided to ensure import clearance success. C-TPAT Certification allows importers to take advantage of faster import processing with a secure supply chain. C-TPAT reduces customs inspections and improves the security of importer’s cargo. C-TPAT demonstrates a refocus of U.S Customs, now referred to as U.S. Customs and Border Protection (USCBP). The renamed agency’s first priority is combating the threat of terrorism. USCBP is now a division of the U.S. Department of Homeland Security (DHS). C-TPAT offers the trade community an opportunity to assist USCBP in its anti-terrorism efforts while simultaneously obtaining potential benefits in the form of streamlined border crossings, faster import entry clearances, and reduced inspection targeting. C-TPAT is designed to be flexible and scalable to any size company. The voluntary program is also intended to avoid placing excessive financial burdens upon potential participants. C-TPAT membership is not a one-time event. It is a perpetual process that must be integrated into a company’s ongoing operations. During a terrorist attack, or other event of national significance that would halt the movement of freight; cargo controlled by a C-TPAT validated supply chain will be the first to receive customs release and authorization for delivery. U.S. Customs and Border Protection (CBP) requires electronic advance cargo information for all shipments arriving the U.S. by vessel in the form of an Importer Security Filing (ISF). The U.S. importer is required to submit the ISF with CBP no later than 24 hours before the cargo is laden aboard a vessel destined to the United States. James Worldwide can file the ISF on your behalf 24 hours and 7 days a week electronically. A customs import bond, or a *surety bond essentially is an insurance policy to the United States government. It is a guarantee from a surety company that the importer of record will abide by the laws and regulations governing the importation of merchandise into the United States. With few exceptions, U.S. Customs & Border Protection regulations require that a customs bond is posted for each commercial import entry submitted. The bond does not offer protection for the importer and does not relieve the importer of any related obligations. Importers are required to post bonds for the majority of merchandise coming into the United States. 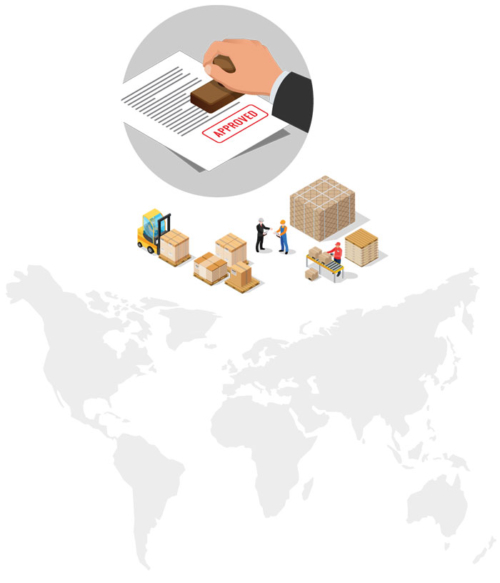 In the event goods are delivered and customs subsequently determines the original entry is incorrect (for any reason) a demand for redelivery of the goods to customs supervision, request for additional information, or reassessment of duty may be made. Failure or refusal by the importer to comply will result in a demand for payment against the bond which will be made by the surety company. A foreign based company can apply for a Customs assigned number through James Worldwide which will allow to obtain a Customs bond and import into the U.S. Customs requires that a foreign importer designate an agent in the U.S. to act as their representative. James Worldwide can obtain this number by submitting it to the Customs via electronically on your behalf. We will be able to obtain a Customs bond and import into the U.S. under that bond once we obtain a Customs assigned number.